(1) Owing to the driving of the vehicle, an accident occurred by which damage was caused to any property. (2) Damage was caused to the vehicle. There are two forms of this offence, the basic form and the aggravated form. 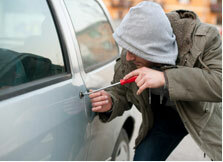 Someone who has ‘borrowed’ a friend or relative’s car without their knowledge could be guilty of the basic offence. Someone who takes a stranger’s car for a joyride and abandons it could be guilty of the aggravated offence. This page is about the aggravated form. The basic offence is Unlawful Taking of a Motor Vehicle. There are a number of possible avenues open to defending an allegation of taking without consent. Legal aid may be available to represent you. It is highly recommended that you seek advice from specialist motoring or criminal defence lawyers who will either be able to help you avoid a conviction or limit the damage by securing a reduced sentence. Rose & Dunn solicitors can represent you for a fixed fee or possibly on legal aid. Contact us for further advice and assistance including a free initial appraisal of your case with no obligation.